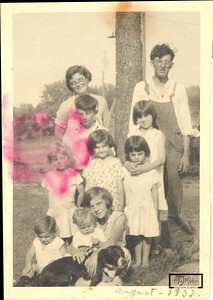 Scanned image restoration of old or damaged photos. Additional restorations can be found at http://www.m2creativedesign.com. 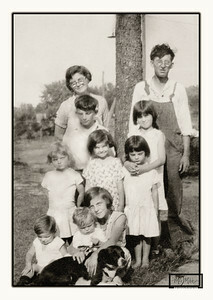 This is a scan of the original photo of the Stearn Family provided by Connie Clark. The red stain and folds in the picture were the challenges in this photo. See next slide for 1st attempt at the restoration. Connie's mom Betty is in the photo. 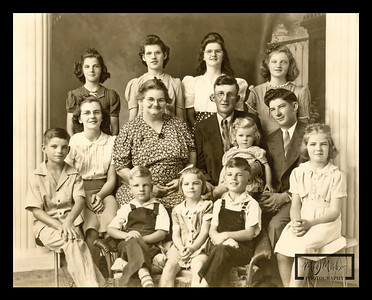 I made the assumption that this was the Clark Family, but it was Betty's siblings and parents, The Stearns. Many of the blemishes have been removed, and the stain has been removed. Unfortunately, the detail under the stain was destroyed, and causes a blurry effect that is noticeable. Connie was very pleased with the results. This is the restoration done with a sepia tone, a bit darker than the original.